Product prices and availability are accurate as of 2019-04-18 00:22:17 EDT and are subject to change. Any price and availability information displayed on http://www.amazon.com/ at the time of purchase will apply to the purchase of this product. Corrosion-resistant 304 stainless steel case and bezel provide a hermetic seal to prevent lens fogging and moisture damage. 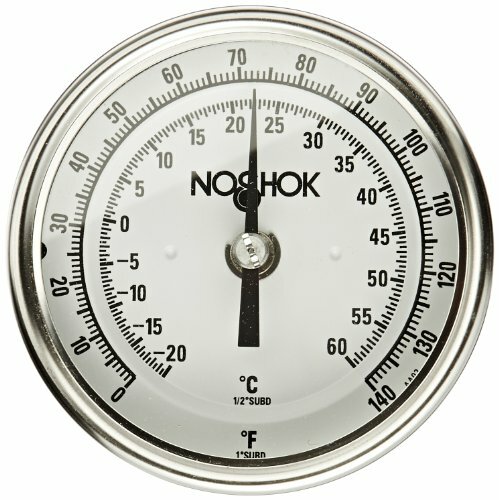 Temperature ranges 0 to 200 degree F, dual scale. Accuracy: +/-1 percent full scale, grade A, ASME B40.3. 1/2" NPT connection. 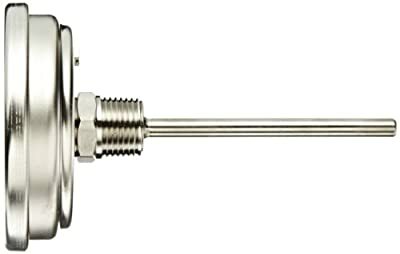 Heavy duty 316 stainless steel stem (0.375 inch diameter). Minimum or Maximum Indicating Pointers are available. The bimetal element is an extremely responsive temperature sensing helix which has been carefully sized, tested, heat treated and aged to relieve inherent stresses and ensure continued accuracy. Slotted hex head adjustment offers field calibration for maximum accuracy at a selected range. For accurate readings, the minimum recommended stem immersion is 2-1/2" in liquids and 4" in gases. Ideal for construction applications where on-the-job piping requires reading the instrument from different angles. Applicable for industrial process, petrochemical, food processing, commercial and wastewater.